Located at the entrance of the Oracle Ridge Mine in the Santa Catalina Mountains north of Tucson, Arizona, on a small bluff is a huge, ancient monolith with unusual markings. This is the second largeest inscribed boulder in the area. Another 10 foot tall monolith was placed at the juncture of Alder Canyon and the San Pedro River, according to the "Journal of the Southwest," by Alice Carpenter/UofA. These two huge stone are possibly clues in "the mine with the iron door" legend. 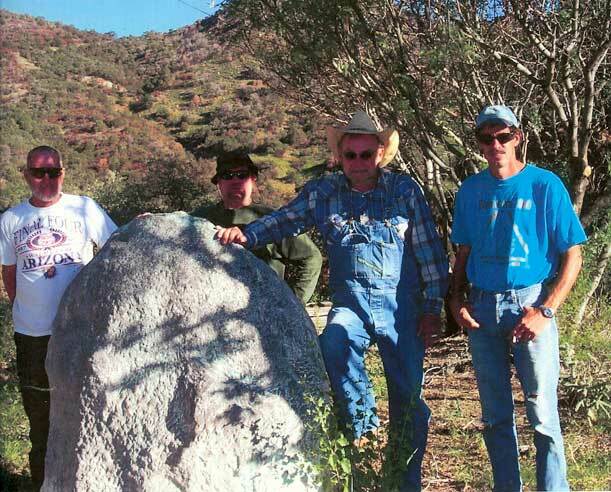 The second, and largest boulder at the San Pedro, was bulldozed over during road building. It's exact location is now unknown. The boulder pictured above has one inch lines and dots in no obvious order. 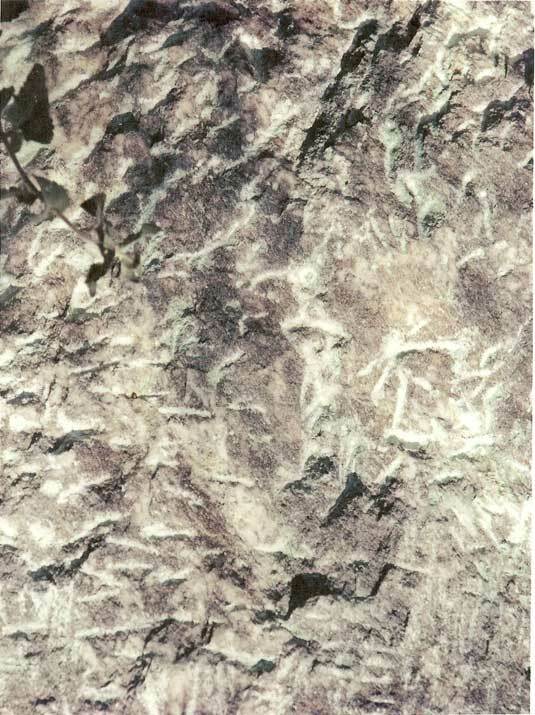 A credible source has identified the carvings as possibly Ionian script, dting about 2,800 years old. Further south near Reddington Pass, an 1880s local news article mentions monolithic stones set upright and a cave system that holds fish with no eyes. A fiction writer could have a field day with these facts, but they are real items requiring serious labor and effort. © 2005-2012 EMOL.org Entertainment Magazine. All rights reserved. Close-up view of the mysterious carved boulder located in the mountains north of Tucson, AZ. Photos courtesy Flint Carter. Photo left: Flint is second from right.